Andy Murray is fighting for his career, and it’s all Sam Querrey’s fault. Bear with me here as you cast your mind back 18 months, when Novak Djokovic, trying to win a fifth consecutive major title, crashed out of Wimbledon in the third round, losing to the world No.41, Querrey. Suddenly and unexpectedly there was blood in the water. And while few imagined that there was anything ominous about Djokovic’s defeat, putting it down to a rare off day, Murray was the player who was perfectly placed to pounce. He duly won his second Wimbledon title, but on this occasion it was a little like reaching the Hillary Step: it put him almost on top of the world. Now he had to push on to the summit. Reunited with his old coach, Ivan Lendl, Murray attacked the rest of the season with even greater intensity. It was the only way to topple Djokovic. The prize was the world No.1 ranking. Thus, Wimbledon wasn’t enough. And winning a second Olympic gold medal – recall that extraordinary four-hour final in the Rio cauldron against Juan Martín del Potro – wasn’t enough. After the Olympic final Murray sat down, buried his face in his towel and cried – “I’m just so tired,” he said, reflecting not only on six draining matches in Rio but an emotionally-charged opening ceremony, where he was British flag-bearer – then he packed his bags and went directly from the stadium to the airport to catch a flight to Cincinnati. He played five matches there, losing in the final to Marin Čilić. From there it was on to New York for the next major, the US Open. Murray went out in the quarter-final as Djokovic – knocked out of the Olympics in the first round by Del Potro – reached the final but lost to Stan Wawrinka. No question: there were enough micro-chinks in Djokovic’s armour to suggest that he and Murray could be heading for a showdown for world No.1 at the ATP World Tour Finals in November. But for that to happen Murray had a lot of work to do. After New York there was a Davis Cup tie in Glasgow, where he lost to Del Potro over five gruelling hours. That was followed by a doubles outing with his brother, Jamie, then a tougher than expected singles match, but a win, against Guido Pella. Murray hobbled through that one: he had a thigh strain. There was emotional pain in Glasgow, too, because it followed the death of his grandfather. It had been a year of off-court upheaval. Murray’s father-in-law collapsed at the Australian Open in January. His wife, Kim, gave birth to their first child in February. He split with his coach, Amélie Mauresmo, following yet another defeat by Djokovic, pictured, at the Madrid Open in May. “Andy is complex,” said Mauresmo, adding that she found his demeanour and behaviour on the court to be jarringly at odds with the Murray she knew off it. At the French Open in June – where Murray was beaten in the final by who else but Djokovic – a profile in the New Yorker described him as “a walking existential crisis”. Then came Querrey’s slaying of Djokovic. Murray’s season turned on that result. Djokovic’s vulnerability as much as Murray’s purple patch – and perhaps the latter owed rather a lot to the former – explained why, after Wimbledon, Rio, New York and Glasgow, he kept going, to the China Open, Shanghai Masters, BA-CA Tennis Trophy and Paris Masters – winning them all. He played 14 matches in October. Then came London, the ATP World Tour Finals at the O2 Arena, and the showdown with Djokovic. The pair met in the final on 20 November, the prize the world No.1 ranking. Djokovic, despite his wobbles, was the favourite; Murray had three hours more court time in his legs; yet it was Murray who won in straight sets, becoming the world’s best player during the greatest era in men’s tennis, and extending his winning run to 24 matches. It was his 23rd match since 4 October. Murray played 91 matches in 2016: a career high. In 2015 he played 88, but previously no more than 79. None of the other members of the big four – Djokovic, Roger Federer, Rafael Nadal – has played 90-plus games in a year, with the exception of Federer in 2006, when he played 95 (and the following year won the Australian Open, Wimbledon and the US Open). Of course it is far too simplistic to trace Murray’s current problems with his hip to his relentless pursuit of Djokovic in the second half of 2016. But you can’t help but wonder. Consider also that in the winter of 2015 he didn’t go to Miami – the first time since 2006 that he hadn’t done his winter training camp in Florida – so that he could spend Christmas with his heavily pregnant wife. This break from the usual routine was followed by his best season. Yet just days after beating Djokovic in London, he was back in Miami, training for 2017. 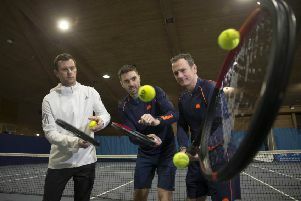 Leon Smith, the captain of the British Davis Cup team, visited him there, reporting back that he was “working as hard as I have ever seen him… it is astonishing the amount of work Andy is putting in”. If Murray’s appetite for hard work doesn’t seem conducive to a long career, it also means that it would be silly to say that at 30 he is finished, even if, last year, it looked as though his body was saying: “enough”. Perhaps he does regret the monumental effort it took to become world No.1 – then again, in reaching that summit, he did something that few believed possible.